Earlier this year, two analog and microwave component corporate giants, RF Micro Devices (RFMD) and TriQuint, announced a merger that took the industry by surprise. 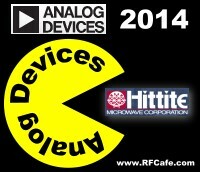 Yesterday, we were knocked back on our heels again by a headline telling of plans for Analog Devices and Hittite Microwave to merge into a single company for a paltry $2.45B. Not being a business or finance guru, I don't know whether to interpret the actions as a sign of a booming economy or a desperate attempt to keep making a profit in bad times. Regardless of the motive, I wish the companies and, most importantly, their employees well. Making a profit is an absolute necessity in order to serve and secure the livelihoods of everyone involved, but unfortunately some people get left behind in the form of layoffs. When the RFMD/TriQuint news hit, I took it upon myself to provide the service of suggesting a new name for the combined companies based on the letters in their names. I simply plugged the two names into an online anagram generator to see what came out. Doing so is usually a good source of humorous words and phrases. I was not disappointed by the combinations of Analog Devices and Hittite. While the number of letters involved is too large to create a reasonable company name, there were a few good company slogans or mission statements that came out of it. Below are two of my favorites, although I doubt the company execs or board of director members will consider any of them. For that matter, I doubt my even mentioning the anagram method will be appreciated.